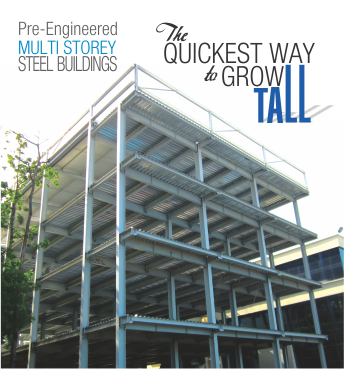 Ideal solution for a Commercial/Office Building, Mall or a Residential tower. Super Fast Construction – at least 6-8 times faster than the conventional RCC Construction. Highly trained design team provides detailed Seismic designs and 3D models for accurate design of each member. Detailed foundation drawings along with anchor bolts and templates, which facilitate accurate casting of the civil foundations. Based on the highest manufacturing standards and in-depth designs, the quality of construction of Cold Steel’ pre engineered steel buildings is unmatched and at par with any international standard/s. Some of the iconic international buildings like the Sears Tower, Empire State Building, Petronas Tower have all been made of steel. In India, Cold Steel has been the pioneer in Multi-storey steel building construction, having completed the legendary 26 Floor IFCI building in New Delhi in the early 90s.